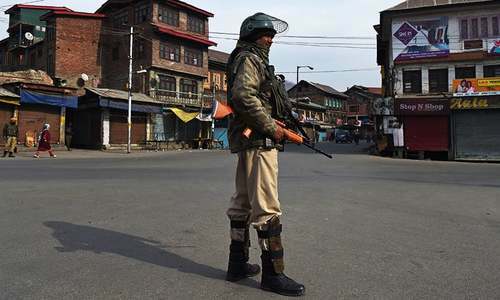 At least 17 people have lost their lives in Indian Kashmir in some of the fiercest fightings this year in the restive Himalayan region, police said on Sunday as authorities braced for more violence. A total of three Indian soldiers and 13 suspected militants died in several clashes south of Srinagar, the main city of the region. 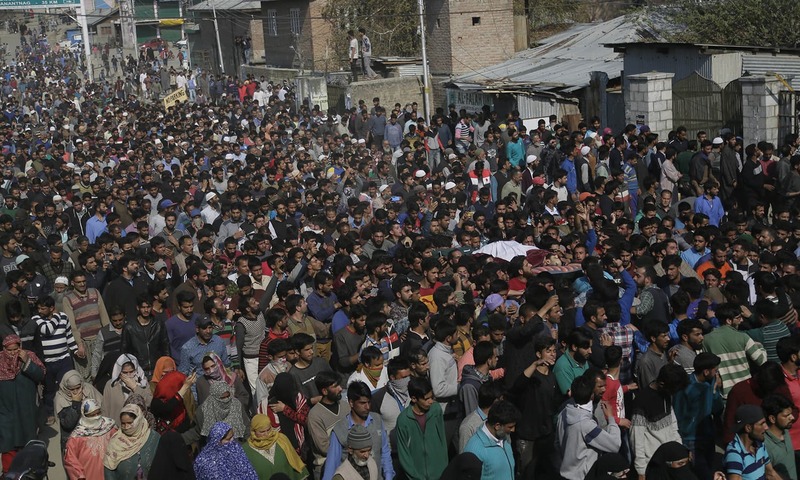 Besides, four civilians were also killed and dozens injured when police opened fire on thousands of demonstrators who poured onto the streets, throwing stones and chanting slogans against the Indian rule. There were also demonstrations in Srinagar, where authorities ordered all schools shut on Monday as rebel groups called for protests. Seven of the alleged militants were killed along with two soldiers in a protracted shootout in the village of Dragad, where helicopters were seen swooping low over the battle zone. Another man, described by Indian authorities as a militant, was gunned down in a brief exchange of fire in Dialgam. Foreign Office on Sunday condemned "the use of brutal and indiscriminate force by India that resulted in the loss of lives of Kashmiri youth". 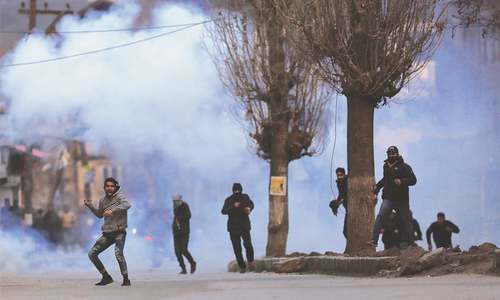 "This mindless killing spree exposes, yet again, the ugly, inhuman face of the state-terrorism that India has been perpetrating against the Kashmiris for decades," read a statement issued by the Foreign Office. "We have repeatedly pointed out that the Kashmiri youth is being deliberately and systematically targeted with a view to breaking the will of the Kashmiri people. 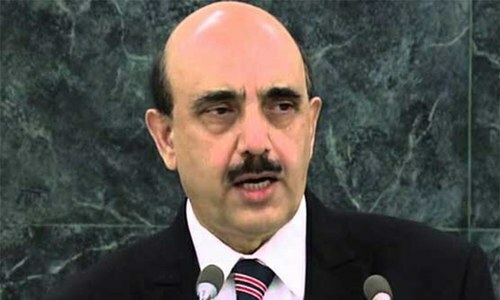 However, such cowardly actions of the occupying forces only serve to fortify the resolve of the Kashmiri people," the FO spokesperson was quoted as saying. It further stressed that "no amount of Indian propaganda to paint the legitimate and indigenous Kashmiri struggle as terrorism could succeed in misleading the world." 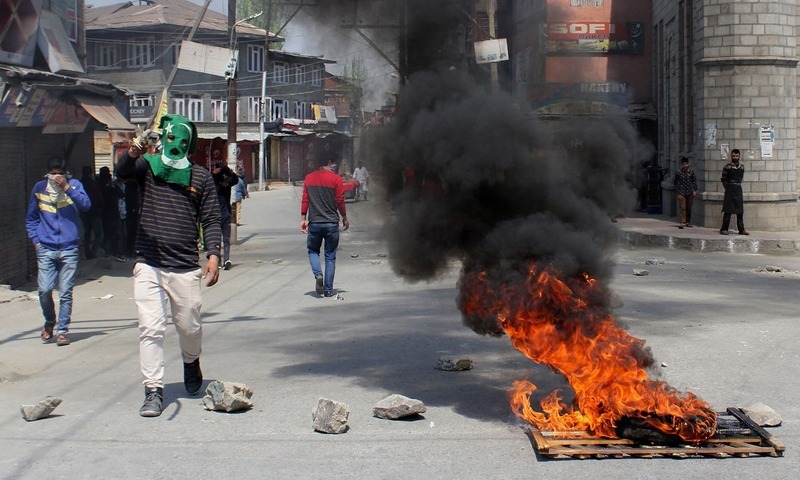 Kashmiris have been fighting for decades for independence or for a merger with Pakistan. Last year was the deadliest of this decade in the region, with more than 200 alleged militants killed in a counter-insurgency offensive dubbed “Operation All Out”. That upsurge in violence has escalated in 2018, with 51 alleged militants already killed this year. 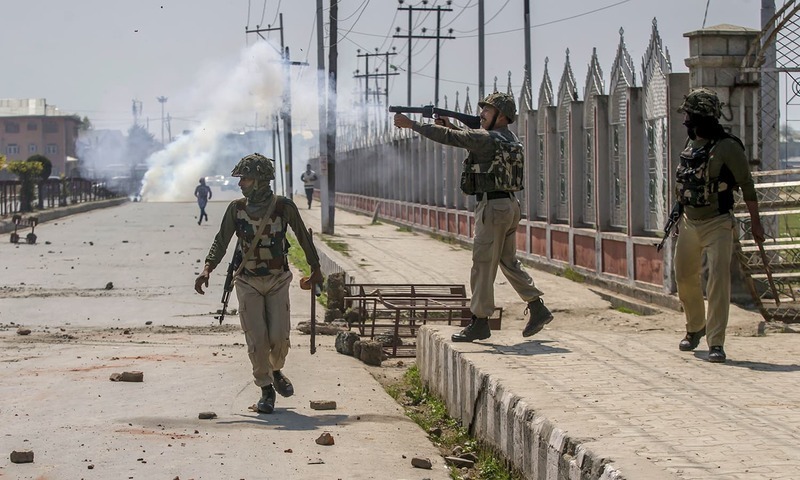 The weekend clashes were the worst since a three-day skirmish in the forests of northern Kashmir last month left ten dead ─ five unidentified militants and five government forces, according to officials. Excellent Action, All hail the mighty forces. militancy has no place in civilised world . good work by security forces. Who ever take up arms will perish from arms !! a terrorist is terrorist ......... nothing more oe less. He should be killed. These legitimate protests have been going on since last 71 years and will continue as long as the barbaric, inhuman, killer and brutal occupying and invading Indian army does not leave the land and people of the India-held and India-occupied Jammu and Kashmir. Militants cannot be allowed to thrive. Their elimination is required from every part of the world. The more you kill the kashmiris the more you bring the end of indian occupation nearer. Tyranny can't last forever... Kashmir will be free. Our support is with the people of Kashmir and thier just cause. Dear Friends, Please do not support anyone who takes up arms to destablise order on either side. Our resolve against the Indian occupation army will not be deterred. We will achieve freedom. We will not rest until the last militant is neutralized. Don't bow down to coward Indians. They will have to pay for each and every innocent life they took. I am an Indian....a Brahmin and I come from a family of long line of army officers. I really want to tell my fellow Indians that, first step to solve kashmiri issue is to recognize that there is a problem. It's a political problem and it should be solved through political means. It modern age of globalization, nobody can be forced to become a citizen of a certain country by force. We need to recognize the political problem of Kashmir and then solve it. Calling everyone who doesn't agree with us, a terrorist is not right. All over world people are migrating across countries and changing the very fabric of the societies. In near future, the very concept of nation states will be obsolete. Now countries, like MNCs, differ only by their governing principles ( constitution) & the opportunities & infrastructure they offer. people are choosing to live in a certain country based upon that. Look at millions of qualified Indians who choose to leave India forever. Do we call them traitors? @Kashmiri from IOK our hearts and prayers are with you brother. We would keep support you untill you fet freedom from barbarian indian army. indian occupied kashmir is close to freedom now. 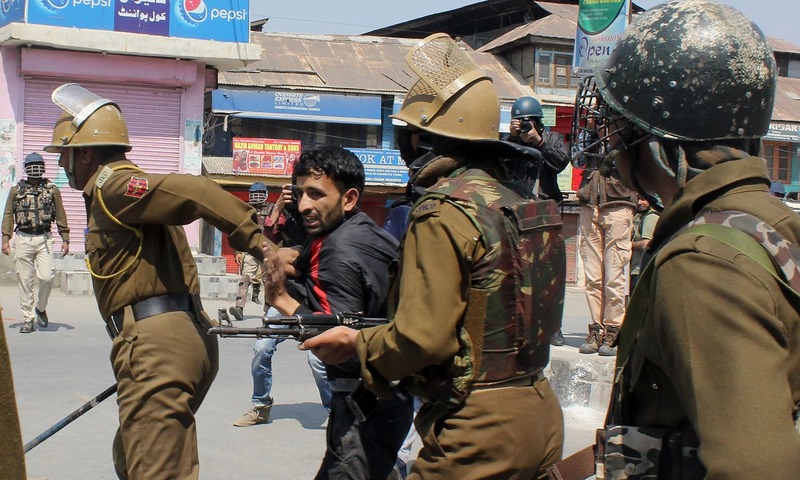 The new generation of Kashmiris are loath india like never before. @Jitendra - Very sensible, nice thought. @Jitendra Excellent Analysis.India and Pakistan need persons like your insight. The sacrifices by the Kashmiri martyrs will not go in vain.. Kashmir will be free.. Kashmiris zindabad ..
India cannot stop these uprisings by force. Politicians in New Delhi will never understand this fact. Indian should stop brutality against innocent civilians and solve the issue on negotiation table according to the un resolution. India is on a losing path. Suppression and aggression has never worked in the past and will not work now in Kashmir. Pakistanis support Kashmiris for self determination based on UN resolutions promise. Pak-Kashmir Zindabad! Since Modi became PM killing in Kashmir by Indian forces has increased many fold, the only solution is independent of Kashmir which looks to be any time soon. Shame on you India the so called largest democracy for denying the Kashmiris their basic human right . Waiting to see the sudden fall of Indian empire as USSR's disintegration. Kashmiris will reply in due time. No amount of Indian brutality can suppress the Kashmir freedom movement, Indian Occupied Kashmir will gain freedom one day. Shame on Indian forces for killing innocent kashmiris. They have right to fight for their freedom. Indian hegemony is trying to compete yet another brutal country, their new gound friend, Israel. Israelis killed 17, so did India. I am amazed at the comments of Indians. @Jitendra dialogue is meaningful if it leads to a meaningful result. And by the way, your being a Brahmin is of no consequence. This is pretty pathetic on both sides. Demanding freedom is a basic right of Kashmiris. No one can take away this right from them. They are being killed by Indian Army for many decades, but that could not suppress their voice and not the current brutalities of Indian can suppress their voice. Kashmir is to free and its people will get it! No one can stop it! 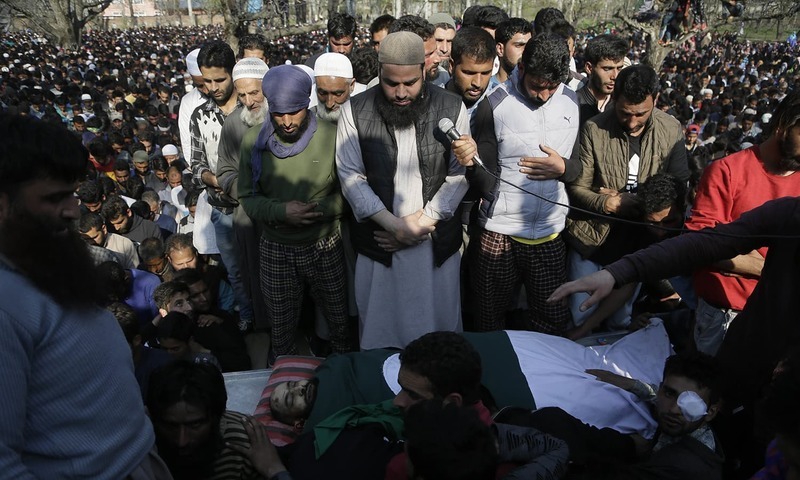 India killing tns of kashmiris indiscrimately as Israel is killing Plestinians. but so called civilized world is worried only about health of skriple. Wow, what a moral world. I see more Indians reacting to the killings while praising the action as if these Kashmiris were involved in killing thousands of innocent people. Does anybody know how the civilians were used as shield and killed by the Indian BRAVE soldiers? To know the reality you ask the locals. But again media won't let you know. @Jitendra Your words are powerful, the only solution, today Kashmirs and Soldiers died all for politicians who are not worth to be on a noble seats of our beloved nations. I know most of India is not represented by the Indian comments here. We have massive problems in IndoPak nothing will happen unless we sit down together and solve them. Firing on innocent people and call them terrorist will not solve the situation only more problems will be created. Sending you lots of love from Pakistan. RIP my people, each and everyone is my family. RIP Kashmirs and Soldiers. I don't want my people to be hurt. Today more Kashmiris died tomorrow more soldiers will but in the end we loose our sacred people are getting killed by live fire, we must sit down talk, or else this will continue Soldiers will get ambush because of this. Force cannot change the mindset of the masses instead it is a proven catalyst to aggravate the spark . History has taught this to us but few want to rewrite the history which is unbearable. Inna lillah was Inna ilaihi rajioun. InshaAllah one day the Kashmiris will have their freedom and rights, free of Indian oppression. @Kashmiri it is not largest democracy., US is largest democracy. India is a fake emulative democracy, not a genuine democracy. @M. Saeed Not in your lifetime! True face of secular india. @Ashok Before that YOU will be FINISH. @C T Rao the Kashmiri freedom struggle has been on going since 1947......The Kashmiris were never given the option of union with the Indian state but instead it was forced upon them and since then the Indian army has been fighting to ensure Kashmir remains part of India......the Kashmiri struggle for their independence or seccesion to Pakistan will continue....as long as they are not.given their.right.to choose democratically..